Gorgeous new William Morris prints! 100% cotton fabrics with classic floral motifs in rich colors. Perfect for traditional home decor, quilting, or romantic garments! It's No April Fool! 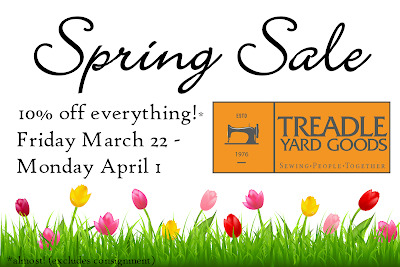 It's The LAST Day of our Spring Sale! One more day to save 10% on EVERYTHING in the store! Stop in today, Monday April 1st! 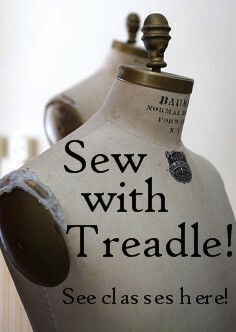 All Fabric, Notions, Scissors, Ribbon, Lace, Trim, Buttons, Patterns, and Classes! Roberta & I have just returned from a major buying trip and are SOOO excited to see grass again! We can’t wait for spring and the new fabrics to arrive! While we wait, help us get the store ready. Take 10% off EVERYTHING!! Yes, EVERYTHING! 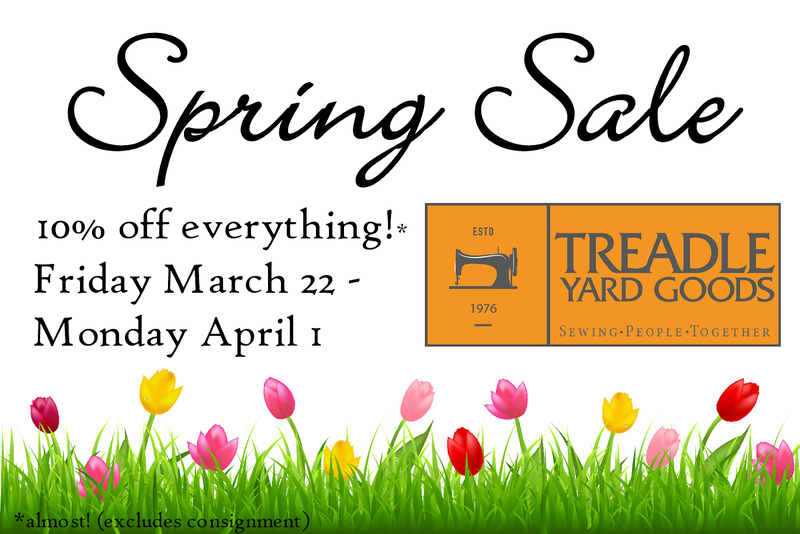 All Fabric, Notions, Scissors, Ribbon, Lace, Trim, Buttons, Patterns, & Classes! 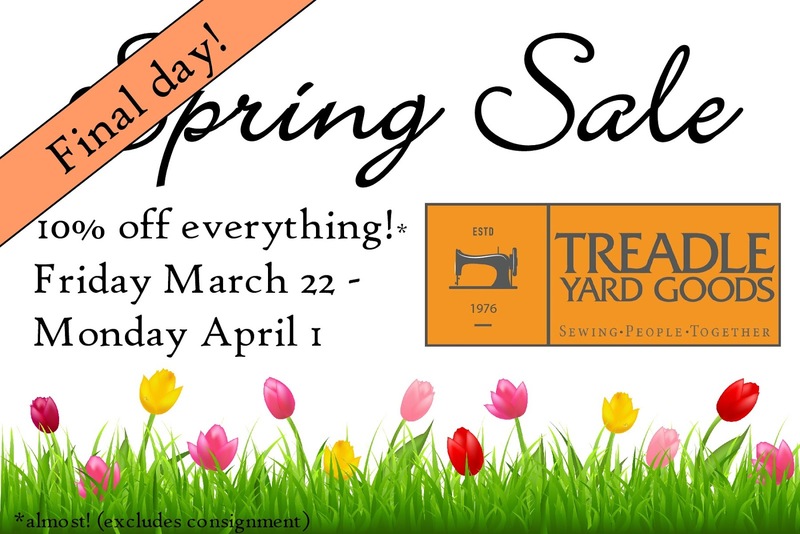 *minor exclusions: consignment items from Becky’s Buttons & Treadlettes. Looking forward to seeing YOU & green grass soon! Treadlette Nina made this cute, springy cotton tunic dress with a great new novelty print featuring laundry care symbols! To keep the facings tidy and add a little visual interest, Nina topstitched in a zigzag pattern. It's such a great detail! She used New Look 6500, a basic shift shape with a few style options. This fabric group has some cute coordinating prints on the same theme! We love the tiny irons, too! This week's Treadlette project is Material Girl Debbie's cute new knit hoodie! This fabric is sold as a repeating panel, and Debbie used the wide borders of the panel as an accent fabric trim! The pattern is from the Christine Jonson Travel Trio Two #331, available from Christine Jonson as a PDF. We'll also have the print version back in stock soon! New cotton knit jerseys from Art Gallery!